In addition to spring cleaning, this is also the perfect time of year to make sure everything around your Illinois home is in working order. 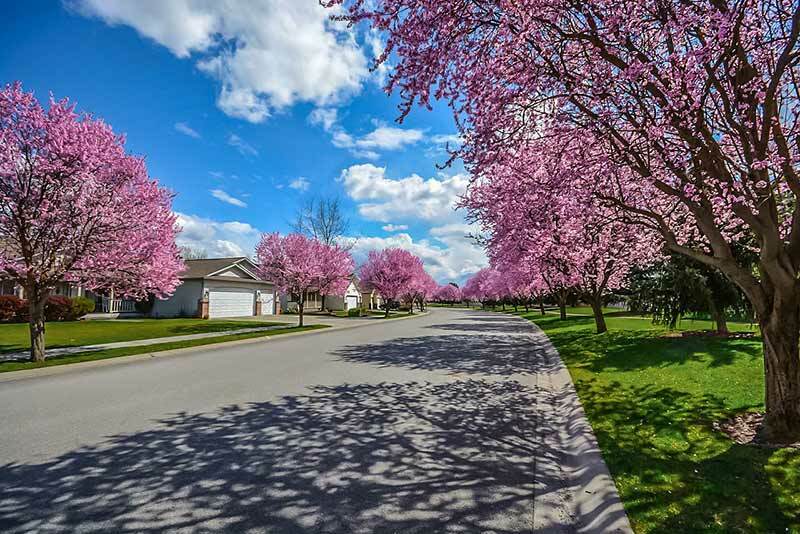 Use this spring home maintenance checklist to undo any damage from winter. This will let you relax during the warmer months, knowing your house is in top shape. Grab your binoculars and check your roof. Look for signs of wear and tear, like shifted shingles or nails poking up. These could create pathways for moisture to get under your roof. Look at your siding, exterior window and door seals and any other part of your home’s exterior that could have been exposed to damage over the winter. Giving your home a once-over can help you catch issues while they’re small and still easy (and cheap) to repair. Now head indoors. Check all of your smoke and carbon monoxide detectors. Again, look at the seals around windows and doors. Even as the temperature gets more moderate, you don’t want to go months without spotting issues. After the winter weather, your windows probably need a little TLC. You can hire a professional, but if your Illinois home is single-story or you feel comfortable on a ladder, this is an easy one to tackle yourself. Grab a squeegee, a soft cloth and a bucket that’s equal parts hot water and white vinegar. Use the cloth dipped in that solution to gently wipe away grime, then squeegee your windows clean and sparkling. Don’t forget to clean your screens, too. Use a mild detergent to get them completely clean, then let them dry before putting them back on your windows. While you’re at it, check them for holes. Since you’ll probably be opening your windows during the warmer months, you don’t want to leave any openings for insects. Winter takes its toll on the plant life around your house, and that’s bad news for your gutters. Use the spring season as a reminder to clear fallen leaves and other debris from your gutters. You’ll be thanking yourself when the spring showers turn to downpours and all that water can safely and effectively drain away from your home! To knock this task off your spring home maintenance checklist, climb safely up a ladder and remove anything you find in the gutter. Then, run a hose up to your roof so you can ensure proper drainage all the way through the downspout. When the water pours out, make sure it runs away from your home’s foundation. Also, check that all downspouts are still securely attached to your home and fix any that have pulled away. Winter temps aren’t easy on hardscaping. Check your driveway and walkways for any signs of damage. Smaller concrete cracks can probably be easily filled if you’re a DIYer, but larger damage to concrete or asphalt generally requires a pro. Again, winter’s cold and moisture can be hard on exterior woodwork like decks and railings. This is the perfect time of year to power wash and reseal all of your home’s wood fixtures so you can enjoy clean, beautiful wood when you’re dining al fresco or relaxing in the yard once the temperatures warm up. While you’re at it, look for any signs of wood damage so you can repair them before they become a safety hazard. No spring home maintenance checklist would be complete without a little grill prep for the summer. If you have a charcoal grill, clean out any ash and grease. If you have a gas grill, check the lines for any leaks by coating them with soapy water. When turned on, gas will cause soap bubbles to form at any leak points. No matter what type of grill you have, make sure it’s at least 10 feet from your house and five feet from anything combustible, including surrounding foliage. No sense in creating a fire hazard when you fire up the grill! Your HVAC system has been pulling its weight all winter. Schedule a service visit from a qualified technician to ensure your AC unit can keep you cool all summer without any issues. You don’t want to wait until the heat sets in to find out you have a problem. Similarly, put replacing all of your air filters on your spring home maintenance checklist. The average Illinois home needs this done every three months, so get in the habit of doing it seasonally. If you don’t, you’re wasting energy. Think about how much harder it is to blow through a handkerchief. A clogged air filter inhibits your HVAC system, making it work overtime. Before you start watering this spring, turn on your irrigation system and walk your property. Look for any signs of malfunctions and correct any sprinkler heads that might be watering your walkways or house. It will take you all of a few minutes, but it can save you from significant water waste or, worse, moisture damage to your foundation.